Baked ham is a great dinner party recipe because most of the work is already done – the ham is already baked and just needs to be basted and heated. We made this classic Glen-Mor Restaurant Sunday dinner recipe for Easter this year, with plenty leftover for upcoming recipes like Cream of Tomato with Ham Soup and Ham Croquettes. Preheat oven to 325 degrees-F. Combine the pineapple and juice with the brown sugar in a small mixing bowl. Place ham on a rack in a large roasting pan. 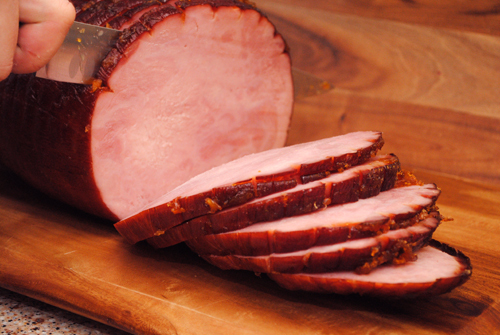 Score the ham approximately 1/2-inch deep spaced 1-inch apart, horizontally and vertically, creating a grid pattern. Pour half of the basting sauce over the ham, reserve the remaining half for basting later. Place the ham in the preheated oven and bake for 1 hour. Without removing the ham from the oven, pour the remaining basting sauce over the ham. Continue baking for another hour. Note: ham should bake for 15 minutes per pound, so 2 hours for 8 pounds. The ham is done when the inside temperature reaches 140 degrees-F. Serve ham sliced with warmed Raisin Sauce, approximately 1/4 cup of sauce and 2 thick slices (1/2 lb.) per serving.